When was the last time you could honestly describe a 600-page nonfiction book as a thoroughly absorbing page-turner? Such length is usually the province of academic works requiring an investment of patience and concentration from the reader. 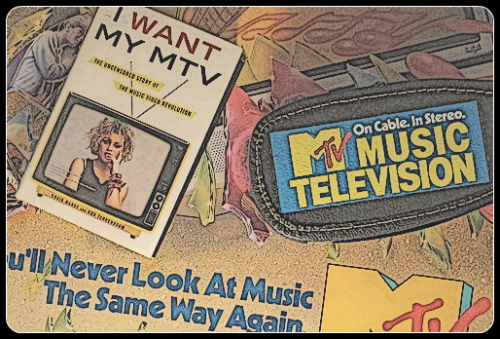 Craig Marks and Rob Tannenbaum’s I Want My MTV: The Uncensored Story of the Music Video Revolution (Dutton, 2011) makes no such demands, at least not if you are of the generation that witnessed the rise and fall of Music Television. You will recognize the names of the artists, videos, and VJs, and you may find yourself as riveted to this sizable oral history as you once were captivated by untold hours of MTV. Like its subject – the first decade of MTV – Marks and Tannenbaum’s weighty tome unfolds as a series of easily digestible segments. The authors eschew editorializing in favor of letting people speak for themselves. Each of its 53 chapters begins with a brief introduction followed by artfully intercut interview transcriptions. The effect echoes the pace of vintage MTV, when the fledgling network actually aired music videos and the mesmerizing imagery turned over with the regularity of a kaleidoscope. In those days, well before the advent of content on demand, I and millions of other teenagers would sit transfixed before the television for hours, strung along song by song in the hope that a favorite video was just around the corner. The J. Geils Band’s riotous Centerfold. David Bowie’s disturbingly surreal Ashes to Ashes. The Rolling Stones’ perpetually amusing Start Me Up. All those exotic, imported videos from Classic Nouveaux, Spandau Ballet, Split Enz, The Specials, Men at Work, and Madness. Bits of lunacy from niche artists like Wall of Voodoo, Oingo Boingo, Grace Jones, and The Vapors (Turning Japanese, anyone?). I was so entertained by most of the playlist that I would sit through as many clunkers as it took to get to the good stuff. At the height of my infatuation, I started to catalog my viewing on discarded, blank spreadsheets (complete with dot-matrix-printer-compatible, perforated, sprocket-hole margins) that Dad had brought home from work as scrap paper. I listed the artist and song, noted whether the video was performance or conceptual, and evaluated its merit on a scale of 0 to 100. How I wish I had those papers now. All I know for sure is that anything off of DEVO’s New Traditionalists earned a 100, whereas the visually dull clips that tried my patience (Marshall Crenshaw’s Someday, Someway; Gerry Rafferty’s Baker Street) were scornfully branded with a big, fat donut. Then somewhere during my college years, I came home for the weekend and wondered what had become of my beloved MTV. Where were original VJs J.J. Jackson, Nina Blackwood, Alan Hunter, Mark Goodman and Martha Quinn? What happened to all the quirkiness that once made the network great? Why were they pandering to kids? Had I just grown up, or had MTV taken a step backward? A little bit of both, I’m sure. Little did I know at the time that the future would hold a far worse transformation, the present reality-TV incarnation that must have teens scratching their heads and wondering what in God’s name the M stands for in MTV. I Want My MTV covers every facet of the channel’s devolution from hungry innovator to bloated media giant. Its founders were pioneers who found themselves settling a lawless territory where rock ‘n’ roll excess and debauchery were simply taken for granted as part of the job. From drug-fueled, marathon video shoots to more mindless promiscuity than a season of Melrose Place, nearly everyone in the industry was sowing their wild oats. That much might have been guessed, but I Want My MTV offers surprising tidbits as well. For example, who would have guessed that among the Original Five, J.J. Jackson was the biggest party animal? He always came across as a polite and laid-back guy to me, like a cool big brother. And nowhere else have I ever heard that sister station VH-1 was designed to fail as a “fighting brand”, copying every move of Ted Turner’s rival upstart Cable Music Channel in order to dilute the competition. (Don’t remember CMC? That’s how well the strategy worked). The book is most entertaining when it chronicles disaster, and as various professional failures and personal implosions litter the legacy of MTV, there is plenty to amuse. Best of all is an entire chapter entitled, “A Whopping, Steaming Turd,” devoted to what is generally regarded within the industry as the worst music video ever made, a jaw-dropper that single-handedly destroyed the recording and performing career of its artist, Billy Squier. As you may recall, “The Stroke” was silly enough as it was. Yet your average teenage white boy could endorse it without embarrassment, and it is not the focus of this chapter. That distinction goes to “Rock Me Tonite”? What? Never heard of it? Neither had I, even though it received the full MTV World Premiere treatment in 1984. “Rock Me Tonite” was so horrendous that the video and Squier, himself, went off the radar shortly afterward. It must be seen to be believed. Now, thanks to the unrivaled and merciless resuscitive powers of YouTube, you can see it for yourself. I’m warning you now that Squier prances about like the spastic offspring of Ed Grimley and Richard Simmons. What’s worse, you’ll never be able to see Billy Squier again and not think of this lowlight. Even “The Stroke” becomes leagues dumber when viewed as a chaser to “Rock Me Tonite.” Career-destroying, indeed. “It’s on YouTube,” by the way, is a familiar refrain in the oral histories of I Want My MTV, whether in reference to notorious videos or incidents like Bobby Brown allegedly dropping a vial of cocaine while dancing onstage at the 1989 Video Music Awards. It’s a telling comment, for if video did, indeed, kill the radio star, on-demand video streaming put the nails in the coffin of music television. There’s no longer any need to watch hours of TV in the hopes of catching anything. There was a time, though, when it all seemed worth it, and it is aptly chronicled in I Want My MTV. SIR MIX-A-LOT is a Seattle-based rapper best known for his 1992 number one hit “Baby Got Back.” He likes big butts.